I have been seriously neglecting my blog lately. I haven’t felt much like writing. Or cooking. My biopsy results weren’t good and I start another round of immunotherapy in two weeks. On top of that, I’ve had a nasty cold and cough that has completely obliterated the functionality of my taste buds. You could feed me hot dogs or brussel sprouts or anything else I won't normally eat and if I closed my eyes, I'd never know. But a couple of weeks ago, I did attend an interesting seminar focused on taste. 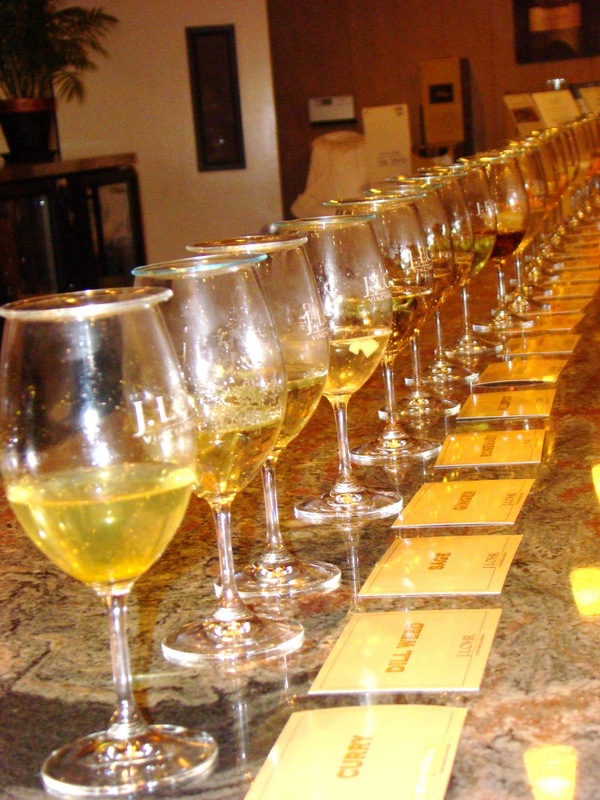 It was a wine descriptor seminar at J. Lohr Winery. I’m always trying to find a way to improve my ability to detect and describe the flavor, aroma and bouquet of wine and this class was a great way to learn and practice. We started the evening by identifying the different areas on the tongue where flavors are detected by using the same wine “spiked” with bitter, sweet, salty and sour. Next we had the opportunity to smell the same white wine with a multitude of different individual added ingredients that you might detect in the smell of a white wine, such fruits like lime, grapefruit, pears, apples, mango, and pineapple, vegetables like asparagus and spices like vanilla, sage, curry and dill. You get the idea. Then we had four distinctly different white wines for tasting for which we attempted to describe their aroma, bouquet and taste based on what we had learned. By this point I was overwhelmed. But we still had the same process to go for the reds. The additions to the red wines included fruits like cranberries, strawberries and currants, as well as chocolate, coffee, cinnamon, black pepper, green pepper, olives, green beans and many, many more. We then tasted and described four red wines. My nose and my tastebuds were saturated by the end of the night, but it was a very informative class. Some people had been there up to three times to practice honing their skills. I can see why. I have a long way to go. I can never really taste what the description says... A few nights ago I did get one though, and it was like a light bulb going off, wow, I saw it!! Hang in there Judy, we've been thinking of you and sending healthy prayers and thoughts your way. Judy: I'm so sorry for your biopsy results! I have no doubt, however, that you will get through this round of treatment and be back to normal before you know it! Until then, PLEASE let me know if there's anything I can do to help! I am thinking of you and sending my "get well" prayers your way!! This is top-notched blog. Great content and wine reviews.